Tchotchke: pronounced (ˈCHäCHkə), Yiddish – A small object that is decorative rather than strictly functional; a trinket (Webster’s Dictionary). The Urban Dictionary defines Tchotchke as: A small piece of worthless crap. Everyone has them. Little knickknacks hidden behind other knickknacks collecting dust. Perhaps they are kept in a box, maybe a secret treasure chest type box. Tucked away. To an outsider it may look like a rock, but to me, it’s a gift my son gave me when he was three. I keep it in my purse. A blue bird with a chip in it’s beak, was a gift from Edna Degraffenreid, a woman who worked with my mother. I was fourteen. I don’t remember packing or unpacking it, but it has moved with me and after 40 years, it still has a home on top of my dresser. 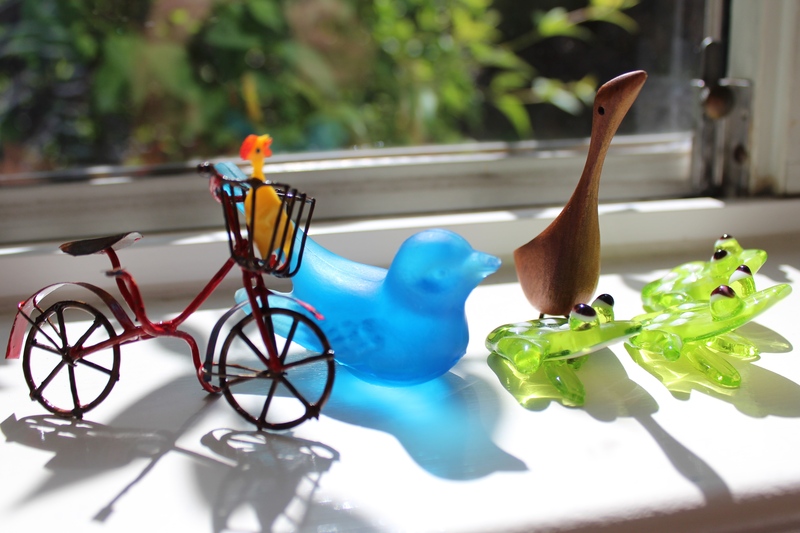 I have three Murano glass frogs my mother-in-law brought back from Italy. There was a slight panic when I dropped one and broke its leg and a failed attempt at gluing. The sentiment remained intact. When Uncle Winston passed away, a couple of the cousins and I packed up his house. One keepsake I took with me was a faux Limoges box shaped like a carrot. 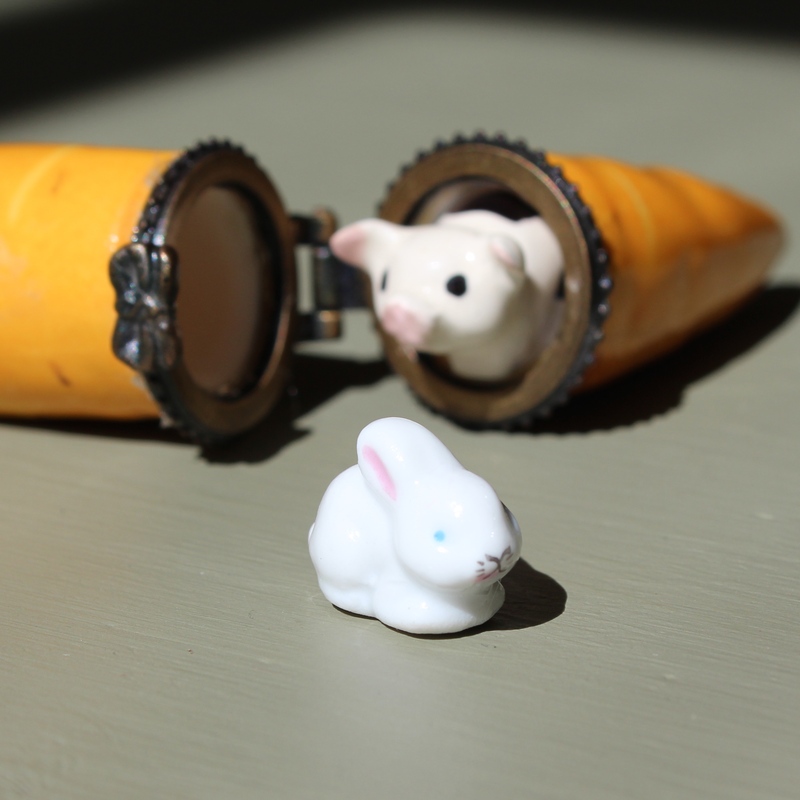 There’s a tiny white rabbit inside. Turns out, my sister was the one who gave it to him. Inside the goodie bags at my daughter’s 5th birthday party, her guests found a tiny ballerina with a magnet at the base of its feet. The tiny mirror that came with it is also magnetic. Put them together and the ballerina dances. I want her to dance. She spins and stops, spins and stops. She stares. In the end she performs a lovely adagio. A tiny glass dolphin. 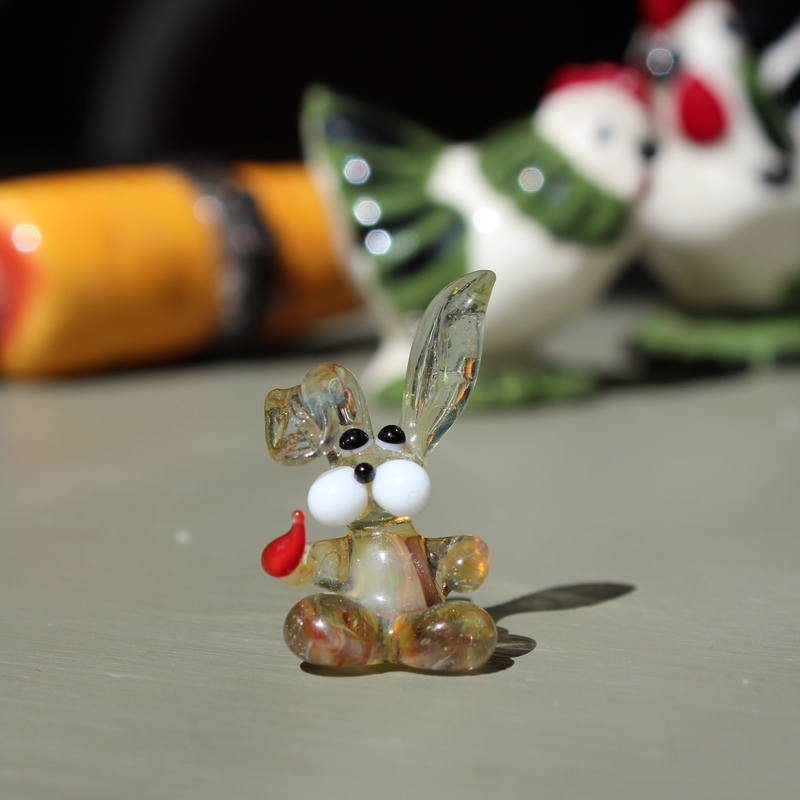 A small glass bunny. 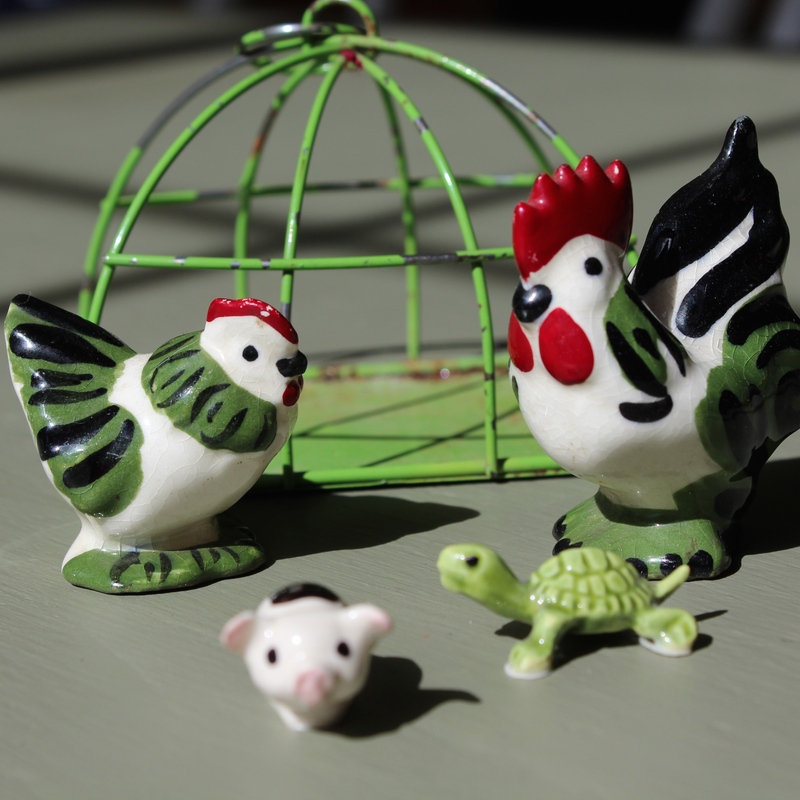 A turtle, a pig, a teeny weeny rubber chicken. A long neck goose carved out of teak, a p encil sharpener shaped like a cannon from the Alamo. A minuscule teddy bear and blanket crocheted with vintage yarn. The craftsmanship of this little bear is amazing. I met the artist and admire her work, we belong to the same Artist Guild. 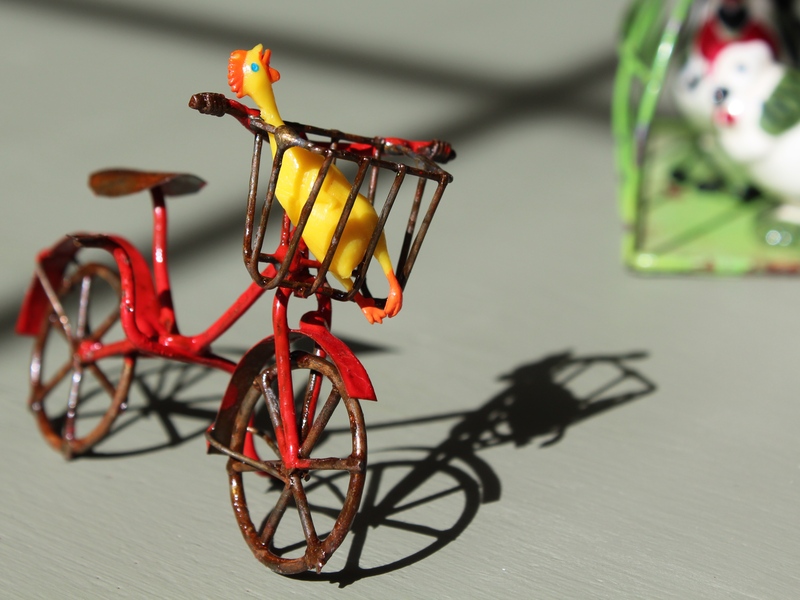 The teddy bear wanted a ride on the bicycle after he saw the rubber chicken ride by. 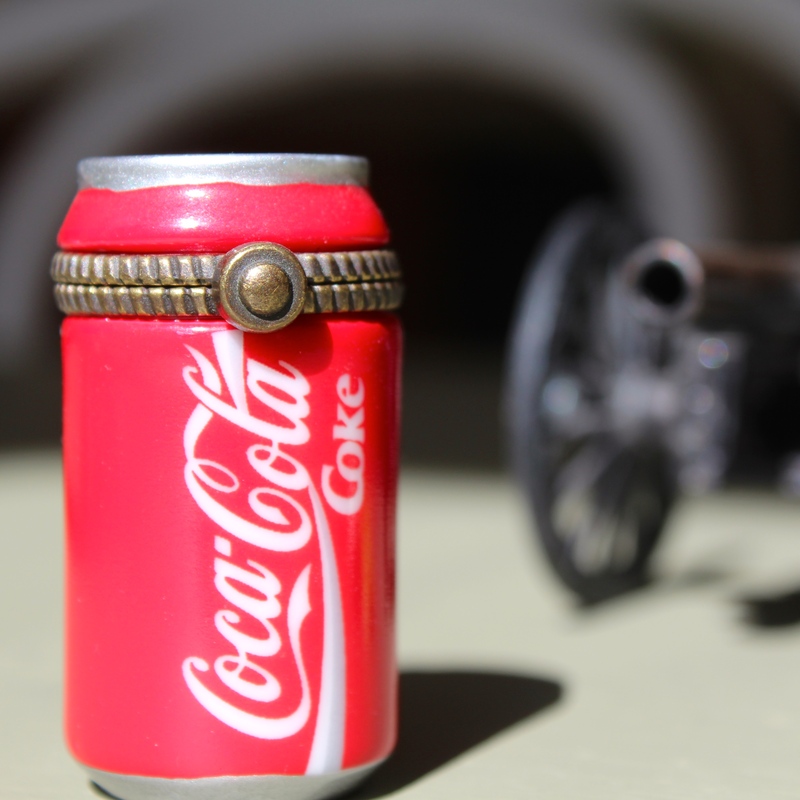 Tchotchkes. Taking them down from the shelf is kinda like looking at old photographs. The memories come flooding in. Mother’s Day. 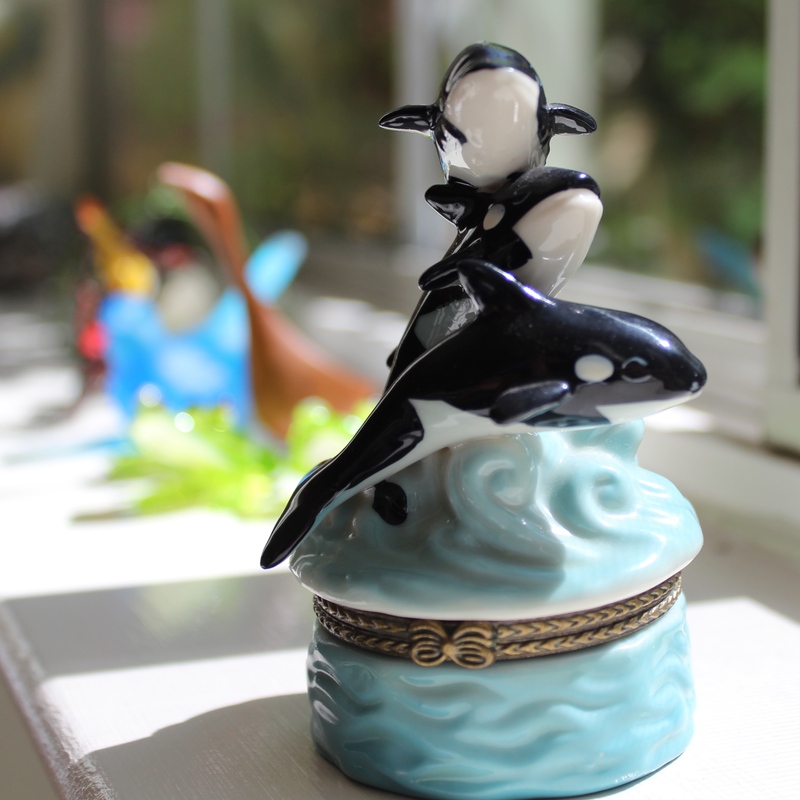 A souvenir from Sea World. My son’s gift to me. Handblown glass bunny found at a toy store in Berkeley. My daughter was four. A mommy daughter shopping date. This belongs to my son. There’s a small straw inside (it’s broken). The spotted pig fits inside of the carrot! 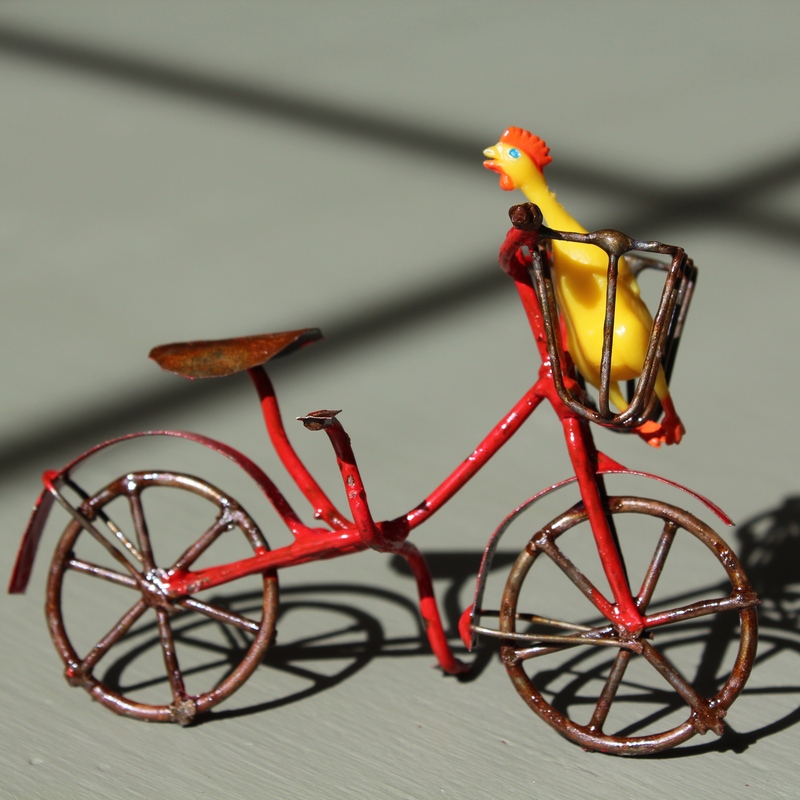 A tiny rubber chicken riding on a bike is pretty funny!